Take a photo with webcam online on this site. Step 1. Enable access to you webcam for the app. Without it you cannot catch a signal from webcam. Step 2. Take a photos, pressing a green button "Click" in the right bottom corner. Step 3. Select the best pics and download them on computer. What should you do, if there is not signal from webcam? If you see this inscription, this could happen because one of the following reasons. First of all, the device can be incorrectly connected to the computer. Secondly, the necessary drivers for a webcam can be not installed. And thirdly, there could be wrong device in parameters of a flash player. It can happen if there are several multimedia devices connected to your computer at the same time. 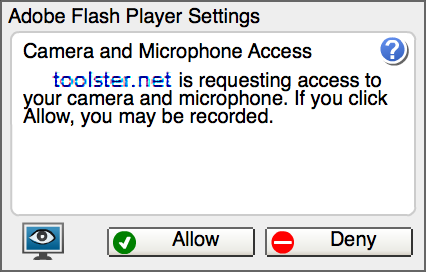 In order to fix this problem, open parameters of flash player (right click on app -> Parameters), open the tab of webcam and select the necessary device. Photos taken by you are kept only in your browser (because app does not work on a server, but is loaded locally). They are not published anywhere and disappear after you close the browser tab and exit the site. Even developers of this online service cannot view a photo taken by you. Here you can make a photo on webcam online: tips. Actually you can take a photo on webcam which will be even batter than those taken by digital camera. But for this you should observe some rules concerning illumination and some other nuances which we'll discuss below. We would like to note that a quality of photo still depends on quality of your webcam; therefore if it is very bad and old, you probably won't get nice pictures even at observance of all rules of portrait shooting. First of all, very much depends on illumination in your room. When you make photo on webcam, it is better to switch the light or sit opposite to a window, if it's a daytime. In the evening you can direct a desk lamp or something like that on you. Since the photo is taken on a webcam, its correct focusing depends much on light exposure. Secondly, you need a contrast background. For example, if you sit in a white T-shirt and make a photo against a white wall, then even in conditions of average light exposure your cam can be focused incorrectly, therefore photos will be blurred or dim. That's why try to make a photo on such background which would contrast with colour of your clothes. Thirdly, try not to make any abrupt movements during taking a photo online on a webcam. The matter is that unlike digital chambers, webcams cannot compensate movement; therefore there can be bizarre things on taken pictures. Just stand still during pressing the button of app. Observance of this condition and previous will allow you to make very good photos by means of our free service. What devices can help you to take a photo on webcam. If you personal computer or laptop has a webcam, then you can take a photo on this site without any problems. Also if there is a webcam in your phone or Android tablet, you can take a photo as well, but provided that you have installed Adobe Flash Player. The only devices which are not supported by our service are iPhone and iPad, since they do not have Flash Player, as a rule. You can make a photo on webcam using space key. If it is inconvenient for you to click the left mouse button, then you can take online photo with web cam pressing space or enter keys. They work the same as mouse button. The only difference is that in some cases it can be more convenient. Also, in a view mode you can page photos by arrow keys.